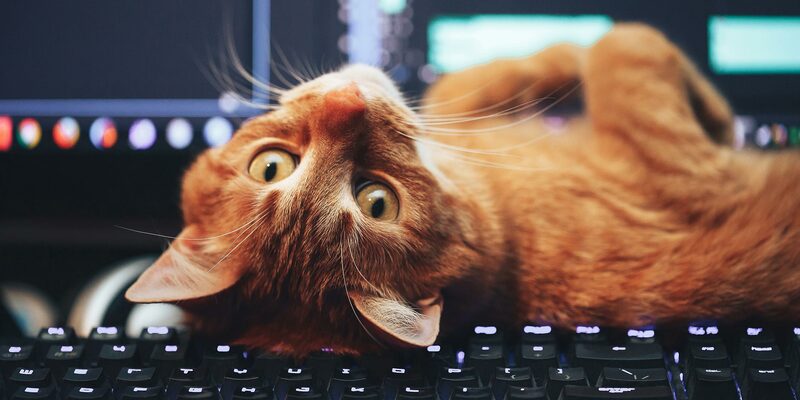 Take a Look at How Twitch Kittens Used Gleam to Run Back-to-Back Giveaways Which Grew Their Streaming Community and Drove Views, Follows, Sales & More. 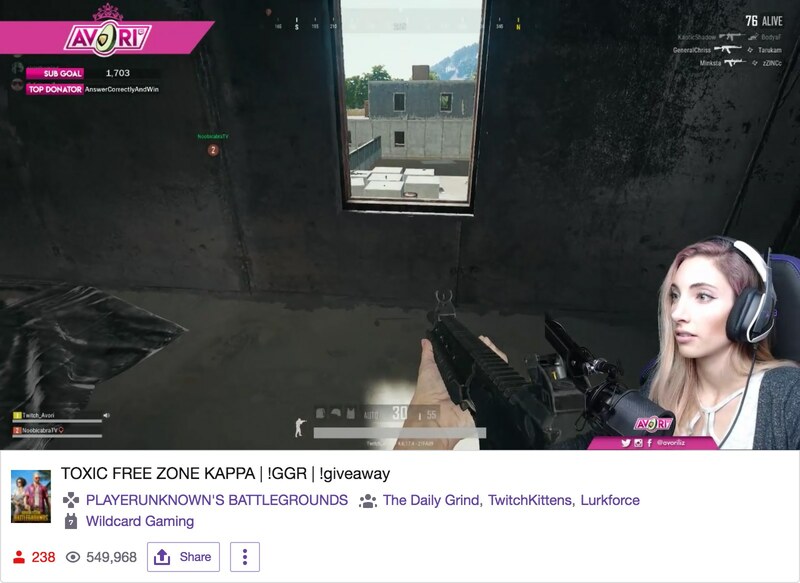 Twitch Kittens significantly grew their streaming community's viewership, social following and revenue opportunities by running two well-executed giveaways using Gleam Competitions. If you operate a Twitch channel then you know exactly how competitive the online streaming world could be. Finding, engaging and encouraging action from viewers are all challenges that every streamer will constantly face, and if you want to successfully grow your channel and generate revenue, they are challenges that must be overcome. Putting on a great stream is incredibly important, but that isn't all it takes to find success on Twitch. If you want to grow your channel you will need to take strategic action that will help you generate awareness, increase your viewership and drive powerful actions from your audience. This is exactly what Twitch Kittens have done by running giveaways that have proven to be highly effective in growing their following and driving revenue. Twitch Kittens are a Twitch streaming community formed by popular streamer, Khaljiit, in 2016. Since their creation, Twitch Kittens has grown from a small female-focused community to a a hugely popular Discord partnered community with two official Twitch teams, an impressive social media portfolio, and a physical presence at many gaming conventions. The purpose of the Twitch Community Kittens is to provide a haven for streamers, viewers, graphic artists, game developers and viewers. This is to be a place where streamers who cast under games, IRL, or creative can connect with one another, find new games to play, and make friends. The Twitch Kittens team itself has grown to 232 members and over 1.7 million combined followers. These numbers only increase when you factor in the entire community. 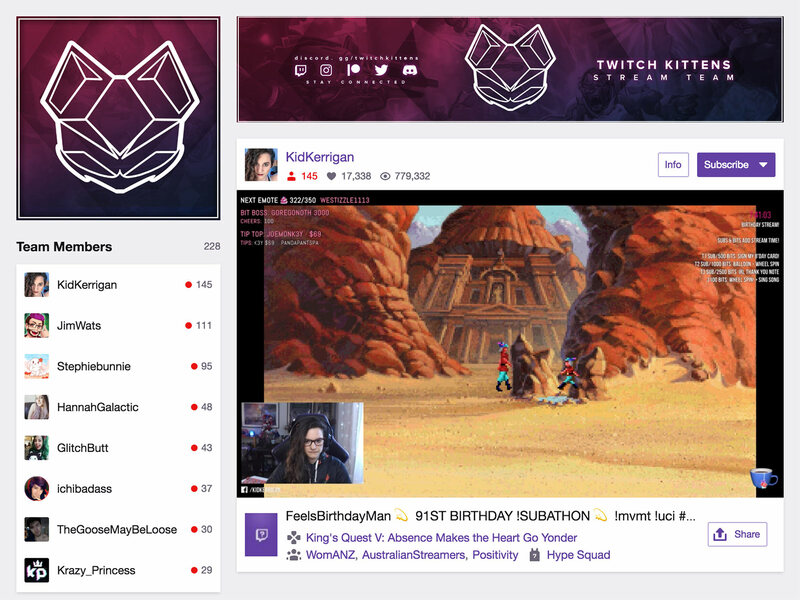 Even with this impressive online presence, Twitch Kittens are still making major efforts to not only grow their community and their following, but also improve the value that they provide to their streamers and fans. 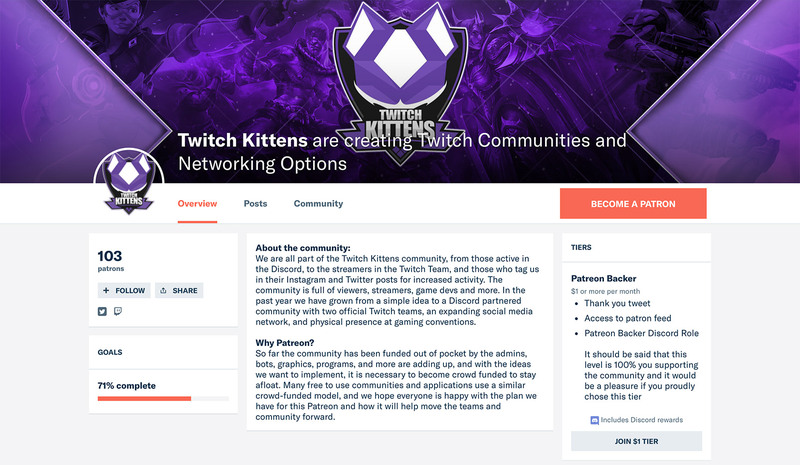 Twitch Kittens plans to enhance their overall community with a range of efforts including hosting content creator workshops, running community wide servers, creating a community YouTube channel to promote their team and hosting communal events. Twitch Kittens have always maintained ambitious plans for growth and improvement which have required them to find constant ways to grow their following, strengthen their community and bring in revenue through subscriptions, donations and merchandising. This drive for growth is where Gleam came into the picture. Khaljiit, the founder of Twitch Kittens has had consistent success using Gleam to run giveaways which have generated awareness and incentivised actions that help Twitch Kittens find new followers and grow their community. Twitch Kittens enjoyed particularly enormous success with their Gleam campaigns when they gave away a DXRacer Gaming Chair and drove over 240,000 actions. They immediately followed up on this success by running another, nearly identical campaign which gave away a custom AKRacing SX Gaming Chair and drove another 240,000 actions. These giveaways are to celebrate and provide value for our community while bringing in new members to the community in an attractive way. These giveaways helped Twitch Kittens engage their audience, grow their online following and strengthen their community. Campaigns like these are a simple but incredibly effective strategy. Participating users could enter the draw to win a top-of-the-line gaming chair by completing various actions which benefited the Twitch Kittens community and several of their members. The more actions users completed, the greater their chance of winning. The campaigns were primarily focused on growing the Twitch and Twitter followings of Twitch Kittens and their streamers, but many other high-value actions were also included. Both campaigns had a nearly identical design, except the second campaign devoted more actions to growing their streamers' YouTube and Instagram channels, as well as placed more focus on encouraging the social sharing of the campaign via Retweets and post interaction on Facebook and Instagram. Focusing the campaigns on growing the Twitch and Twitter followings of Twitch Kittens and their members was a smart move, as these two actions are incredibly important for anyone looking to grow their presence on Twitch. For Twitch streamers looking to expand their audience and grow their viewership there aren't many more powerful actions you can incentivise than Twitch follows. Driving follows is an outstanding way to encourage both first-time and repeat viewings as well as open the door for future subscriptions, donations and advocacy, making this action incredibly important to the growth of the Twitch Kittens community and the streamers within it. Twitch Kittens used their giveaways to promote a wide array of their streamers. To allow them to promote as many different streamers as they could without making the campaigns overly cluttered, Twitch Kittens included Twitch Follow actions for different streamers at different points in the giveaway. This gave 14 separate members of the Twitch Kittens community the opportunity to benefit from the campaigns. Using giveaways to drive Twitter follows is another highly effective tactic you can use to help grow your streaming presence. Maintaining an active presence on Twitter is a terrific way to draw consistent attention to your stream and aid your long-term promotional efforts, and using giveaways to incentivise Twitter follows is a great way to bolster your presence on the platform. While these two action types were the focal point of the Twitch Kittens campaigns, several other highly effective actions such as joining the Twitch Kittens Discord server, visiting their Patreon page and merchandise store, and subscribing to streamers' YouTube channels were also incentivised. YouTube has since prohibited incentivising subscriptions with 3rd party apps, but contests can still be used to drive traffic to YouTube channels. These visit actions played a vital role in the campaigns' success. By getting users to visit their Patreon page and merchandise store Twitch Kittens were able to drive traffic to two of their key revenue sources. This allowed them to further promote their offerings and encourage revenue generation through the purchasing of merchandise and the patronage of their community. A factor which greatly contributed to the success of the Twitch Kittens giveaway was the highly appealing and targeted prizes they chose. By giving away prizes as valuable as high-end gaming chairs, Twitch Kittens were able to make entry incredibly appealing and encourage entrants to complete as many actions as possible in order to maximise their chances of winning. This proved to be highly effective as the giveaways generated an impressive average of 17 actions per user. 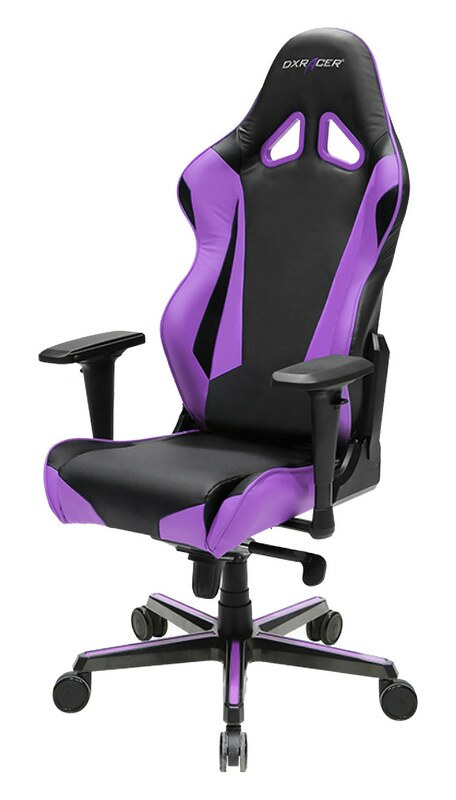 The fact that a gaming chair is highly relevant to Twitch Kittens' target audience also added significant value to the campaign. If the prize was something more generic, Twitch Kittens would run the risk of incentivising actions from irrelevant users who just want to win a prize. However, by offering a prize that is specifically targeted towards the gaming community, Twitch Kittens were able to ensure that the bulk of entrants would be gamers and streaming fans who had high potential of becoming viewers, fans and supporters. Twitch Kittens knew that their target audience could be best found on Twitter, so that's exactly where they devoted the bulk of their promotional efforts. Twitch Kittens sent out promotional Tweets announcing each of their campaigns and had many of their streamers Retweet the posts in order to reach a wider audience and give the campaigns as much exposure as possible. Social media is often the common thread for Twitch streamers to interact with each other while looking for ways to improve so advertising a giveaway on social media leads to users joining and becoming part of our community. A large portion of these campaigns' success can be attributed to the way Twitch Kittens expertly leveraged their community's overall reach to drive actions which benefited both the community as a whole, and the individual streamers within it. By using the giveaways to promote streamers from their community Twitch Kittens were able to grow their followings and help strengthen the overall Twitch Kittens Community. Similarly, by having these same streamers Retweet the giveaways and promote them to their own followers, Twitch Kittens managed to tap into those audiences to cross-pollinate their own following and drive other powerful actions like Patreon and merchandise store visits from targeted users who were already familiar with the Twitch Kittens community or the streamers within it. We use our network of streamers to also promote the campaign so we not only attract our followers but all of theirs. In addition to announcing and sharing their campaigns, Twitch Kittens also sent out follow-up Tweets which reminded their followers to enter their giveaways. They even added additional Twitch and Twitter follow actions to the campaigns as they progressed to keep things fresh, encourage the completion of extra actions, and gain exposure from new audiences by incorporating more streamers into the giveaways. As well promoting the campaigns from within the community, Twitch Kittens also had great success by encouraging their audience to get involved with the promotional efforts. They achieved this by asking users to Retweet their announcement post using the Retweet actions in both giveaways. 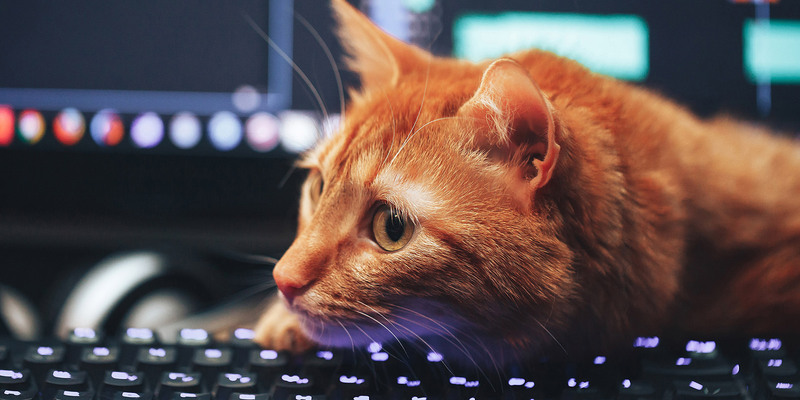 Getting users to Retweet the campaign worked terrifically during the first campaign, so Twitch Kittens ramped things up in this department for their follow-up campaign. In addition to giving users entries for Retweeting the campaign, Twitch Kittens awarded entries to users who Retweeted some of their other promotional material. They also awarded entries to users who viewed certain posts on Facebook and Instagram which promoted the giveaway. They asked users to like and share these posts which helped boost promotional efforts on these platforms, however, liking and sharing was not mandatory for entry. These tactics proved to be a great success across the two giveaways. Twitch Kittens drove 25,000 Retweets and over 10,000 interactions on Facebook and Instagram posts! We use the users that enter to promote it through their own social media. Twitch Kittens were able to achieve outstanding results with their two giveaways. 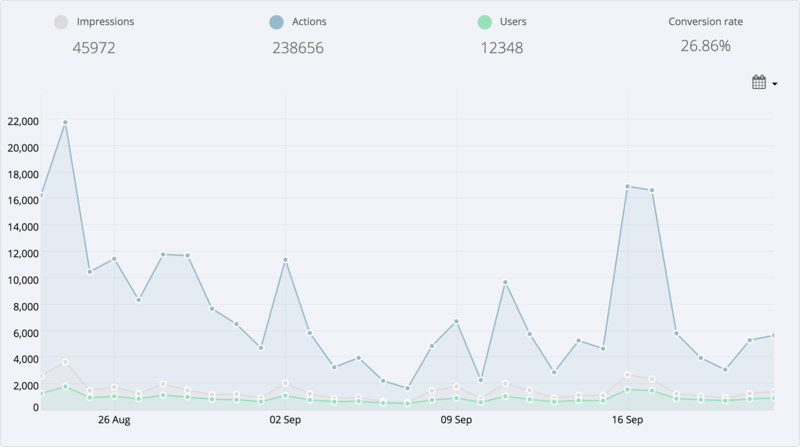 The campaigns generated 100,000 impressions and lead to 480,000 high-value actions being completed. The giveaways had an impressive average conversion rate of 26% and were able to drive 17 actions from every user, highlighting how well Twitch Kittens were able to engage their audience with their Gleam giveaways. 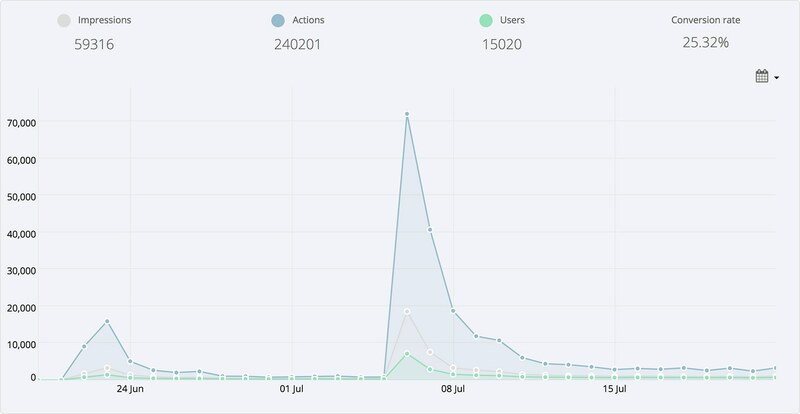 Looking at the giveaway results you'll notice that the campaign enjoyed a huge boom in impressions and actions on the 6th of July. This spike was most likely caused by a combination of the campaign naturally gaining traction over time and a highly influential figure within the streaming community entering the giveaway and Retweeting it to their large following. This just goes to show the huge value that influencers have to offer. I assume someone with a large following entered the giveaway and Retweeted it, many of us in the streaming industry are close and support each other with things like this! I have noticed that if someone like Dr Lupo even comments on a post of mine the engagement sky rockets, so if someone his size entered a giveaway it would cause something similar. By the time the second campaign rolled around Twitch Kittens were able to drive much more consistent impressions and actions, bringing in a steady amount of users for the entire duration of the giveaway. This improvement can be largely attributed to their extra focus on encouraging Retweets and other forms of social sharing, as well as the additional effort that Twitch Kittens, their streamers and their partners put into promoting the campaign across a variety of social media platforms. By driving all of these actions with their giveaways, Twitch Kittens were able to amass great value for their community and the streamers within it. The giveaways attracted an average of 7,265 new Twitch followers for 14 different streamers for a total of 101,718 new followers in the Twitch Kittens community. The campaign also brought in 113,747 new Twitter followers across 9 different accounts for an average of 12,640 new followers per promoted account. Khaljiit was even able to personally attract 282 paying Twitch subscribers and over 13,700 new YouTube subscribers with the campaigns. In addition to greatly expanding their following, Twitch Kittens were also able to drive other highly powerful actions including 8,000+ new email subscribers, 7,500+ new Discord server members and 16,000+ visits to both their Patreon page and merchandise store which helped drive some significant revenue. The results have been great, our social media and discord has really blown up in a positive way, and we have gained a lot of new members. Take a look at the actions driven by each giveaway to see just how powerful these campaigns were. You may notice that some actions have been deleted. This is because Twitch Kittens wanted to promote a variety of their streamers without cluttering the giveaway with too many actions at any given time, so they changed which channels were being promoted throughout the duration of the campaign, deleting each action once it had run its course. All of these actions, particularly the Twitch follow actions have had an immediate powerful impact on the growth of the Twitch Kittens community. The awareness generated by the giveaways have lead to an uptick in viewership and engagement for Twitch Kittens streamers, and the hordes of new Twitch and Twitter followers will allow Twitch Kittens to retain these new viewers and continue to attract and engage fans into the future. [The campaigns] ended up giving me higher viewer engagement and more people chatted in my streams than normal. I can confidently say that most people experience higher average viewers with successful Gleam giveaways. Our Patreon went up over 300% in that month. The merch store saw an increase of something closer to 40%. This huge increase in revenue just goes to show how effective giveaways can be at driving action, as just by asking users to visit their Patreon page and merchandise store Twitch Kittens were able to engage users and drive significant revenue growth. Twitch Kitten's giveaways were without a doubt a massive success, but what are the key lessons you can take away from it and apply to your own campaign? If you're running a competition or giveaway then one of the most crucial components of your campaign is promotion. To put it simply, nobody is going to enter your campaign unless they know about it. There are many different ways you can promote your campaign, but none of them are as powerful as using social media. Social media platforms give you the perfect opportunity to promote you campaign in an authentic and engaging way which allows you to connect with an audience on a personal level and encourage action. Promoting your giveaway in a relatable and personable manner is particularly important for Twitch streamers. 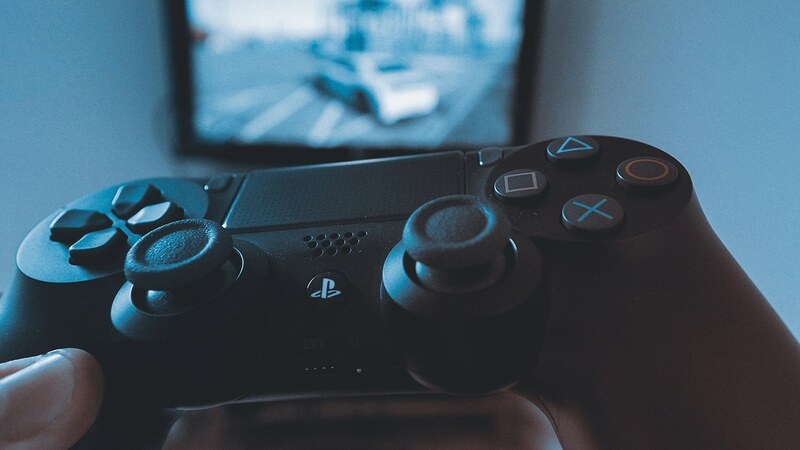 As a Twitch streamer, your success is heavily reliant on your ability to form connections with your audience and keeping them engaged. This is why taking a more personal approach to promotion is so important, and why social media is so powerful. If you're looking for the ideal social media platform to reach and engage your target audience, then Twitter is generally your best bet. Not only does it allow for easy two-way interactions and social sharing but it is also hugely popular amongst the streaming community which makes it the perfect place to find and connect with a relevant audience. Twitch Kittens did an outstanding job of using social media (Twitter in particular) to promote their giveaways. Twitch Kittens regularly sent out Tweets about their giveaways which helped them gain a lot of awareness. They also had many of the streamers that were featured in the campaigns Retweet their promotional posts. This allowed Twitch Kittens to reach and encourage action from a much wider audience. One of the key advantages of using social media for promotional purposes is the opportunity to actively involve your audience in your promotions and encourage the social sharing of your campaign and stream. When you run a giveaway with Gleam you have the ability to incentivise the online sharing of your promotional posts through Tweets and Retweets. This tactic is perfect for authentically engaging users and gaining exposure from highly relevant new audiences. 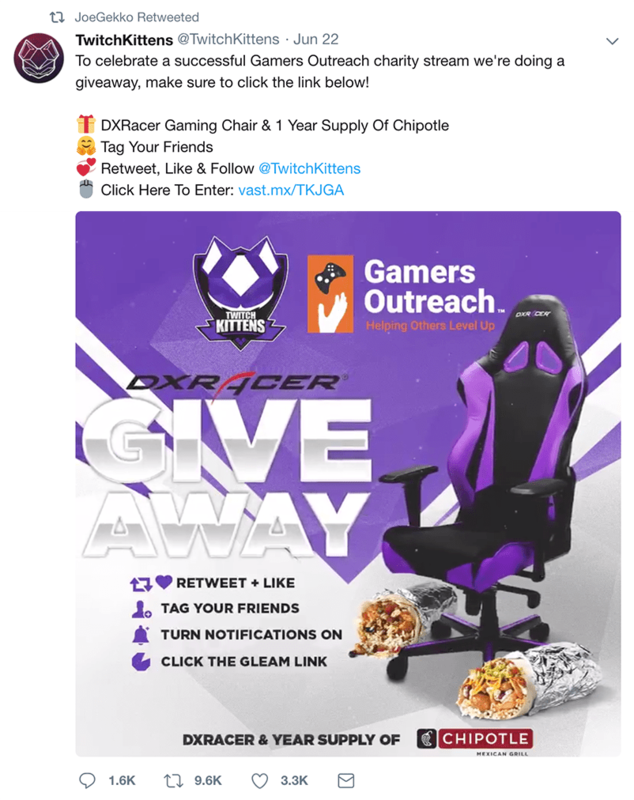 Twitch Kittens took full advantage of this strategy and they were able to generate over 25,000 retweets on three posts promoting their giveaways and community. This allowed them to reach a massive new audience, drive more giveaway entries and increase awareness of the Twitch Kittens community. 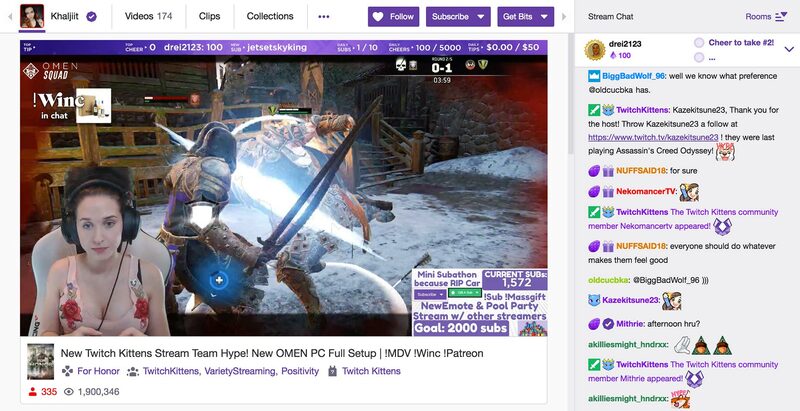 During their first giveaway, Twitch Kittens experienced a massive boost in impressions and subsequent actions when a popular figure from within the streaming community Retweeted a post announcing the giveaway. This lead to over 70,000 actions in a single day. They also enjoyed several smaller boosts during their second giveaway which were likely attributed to Retweets from influential streamers. Although some of these instances of 3rd party promotion were inadvertent, the results they generated, paired with the huge promotional advantage Twitch Kittens received from all the streamers in their community and their partner, Vast Agency, demonstrates the supremely awesome power of influencers. If you're running a giveaway with the intention of growing your Twitch channel and exposing your stream to large and relevant new audiences then it's an outstanding idea to leverage the following of a more established streamer to promote your own giveaway and stream. Getting influential streamers to give your giveaway or channel a shout-out on their stream, Retweet a promotional post or even play a major role in your promotional efforts are all great ways you can get value from influencers. Just remember, the more you want from an influencer the more you will have to offer in return. If you already have an established connection with a prominent streamer it's worth trying to capitalise on this relationship. If you don't it can be just as effective to reach out to a few popular streamers. In exchange for some promotional aid you can offer to host their stream when you're inactive, Retweet some of their posts, or even partner up with them entirely and include actions promoting their channel in your campaign. When you run a giveaway it's incredibly important that you know exactly what you want to achieve. The actions you incorporate into your campaign should be directly working to achieve your aims, so it's crucial for you to know exactly what these goals are. Twitch Kittens excelled in this department as they knew exactly what they wanted to achieve and they focused their campaigns on reaching their goals. They did this expertly through the use of Twitch Follow Actions, Twitter Follow Actions, and Visit Actions which directed users to the Twitch Kittens Patreon page and merchandise store. If you want to attract new viewers you can use Twitch Follow and YouTube Visit actions. If you want to grow your social media presence you should use our various social media actions across Twitter, Facebook, Instagram and even Discord if you are active there. If you are trying to raise revenue on a particular platform or draw attention to a personal website you can use our Visit action to direct users to a store, Patreon page or website of your choosing. Whatever it is you're trying to achieve you will be able to use Gleam's Competitions app to run a giveaway that drives relevant actions. What you need to do is figure out exactly what you are hoping to get out of your campaign and choose the actions that will help you achieve these goals. Running a giveaway is a fantastic way to gain awareness and drive powerful actions. However, to really get the most out of your campaign it's important to make sure that you are able to successfully engage all of the leads you generate during and in the aftermath of your campaign. For a Twitch streamer, running a giveaway is a highly effective way to find new Twitch viewers and drive follows. However, if you want to retain these viewers and turn them into regular viewers, subscribers and advocates then you need to ensure that you are successfully engaging them when they tune into your stream. 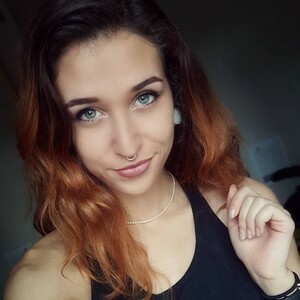 Khaljiit and the other Twitch Kittens streamers have been able to do this to great effect by running consistently engaging streams, interacting with their audience and offering the value which their viewers seek. Learn everything you need to know to grow your audience, engage your following and drive action on Twitch. Engaging your audience is also crucial on every platform you operate on. If you are using your giveaway to grow your presence on social media then you need to maintain an active and engaging online presence in order to retain your newly found followers. You will also need to regularly promote your stream on social media if you are hoping to convert these social followers into viewers. The biggest advice I could give to a streamer is spend just as much time on social media and community building than you do on your stream. You aren't just a streamer, you are a brand. Creating the brand on every social media will create a far stronger web than a single thread on Twitch. Similarly, if you are trying to drive sales, donations or other forms or further action, it's not enough simply driving page visits. The pages you direct users to need to be engaging and able to drive desired actions. Twitch Kittens have done an outstanding job of this. They used their giveaway to drive visitors to their Patreon page and merchandise store where they were able to convert the visitors into patrons and customers. The Twitch Kittens Patreon page presents a compelling and ambitious plan for the future of the streaming community which does a terrific job of rallying visitors and driving donations. Twitch Kittens were able to accrue $1,000 from Patreon just during the first campaign thanks to a combination of driving visits through the giveaway and encouraging further action with a well put together Patreon page. Twitch Kittens had similar success with their merchandise store. They used their giveaways to send users to the store, but once they were there Twitch Kittens were able to drive sales revenue with a sleek store design and high-quality merchandise. 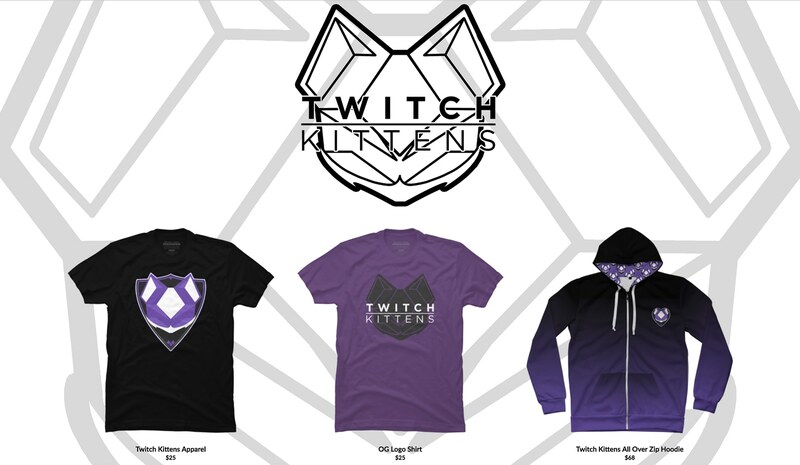 During their second giveaway Twitch Kittens made extra efforts to promote their merchandise store and encourage purchases by offering 15% off their merchandise. This all goes to show that Khaljiit and Twitch Kittens have done an outstanding job of following up on their giveaways by engaging their new and existing audience, driving additional actions and generating value. If you want to make the most of your giveaway it's important that you keep this in mind and remember to make efforts to continue engaging your audience and driving action in the aftermath of any campaign you run. Do you want to incentivise powerful actions and grow your stream with your own giveaway?